When Bob Fogler walked the fields of his dairy farm in central Maine recently, he wasn’t looking ahead. He was looking down and about 4 inches into the earth. Shovel in hand, Fogler plodded purposefully through a cold, dry cornfield blasted by late-winter winds. He stopped often, turned over clods of chocolate-brown soil with the shovel blade, looked for worms, and moved on. Behind him a group of 15 farmers, soil scientists and agricultural specialists navigated through the rows of broken stalks and followed as the fourth-generation farmer spoke about the unseen life teeming under their feet. Fogler, owner of Stonyvale Farm in Exeter, led the group on a spring cover crop walk through fields on the farm where his family has embraced no-till practices and cover crops in order to increase crop productivity. The walk ? sponsored by the University of Maine Cooperative Extension and the Natural Resources Conservation Service (NRCS) ? was a chance for Fogler and his son, Travis, to show his neighbors how they experimented with cover crops and other techniques to improve the health of the soil, and ultimately the sustainability of their cropping system. After completing college in 1974, Bob followed in his father’s footsteps and began farming. He, Travis, and several other family members now run one of the largest dairy farms in Maine. Bob said it took a bit for him to realize that the traditional farming methods they had used for the better part of a century were depleting the health of the soil. When he started to slowly incorporate no-till farming into his practices he began to see a difference in soil productivity. He started by planting into old hay fields that had been killed the previous fall in preparation for growing a crop the following year. He noticed the productivity is highest when no-till planting is done in the year following a killed sod crop, and decided to try cover crops in other years to maintain and increase the benefits of no-till. When cover crops like cereal rye and annual ryegrass were used on portions of his more than 1,400 acres of fields, he said he truly saw a difference in the amount of “life” in the soil. Fogler remarked that it took about 75 years of those traditional farming methods ? including tillage ? on the fields to “kill all the worms out of the soil,” but it only took a few years to bring them back. “We were 100% no-till last year,” Fogler said proudly, stopping in a field where bright green blades of winter rye were blanketing the ground. Most of the cover crop Fogler has used on his fields ? and spread through various methods including helicopter and airplane ? where purchased in part through cost-sharing programs with NRCS. 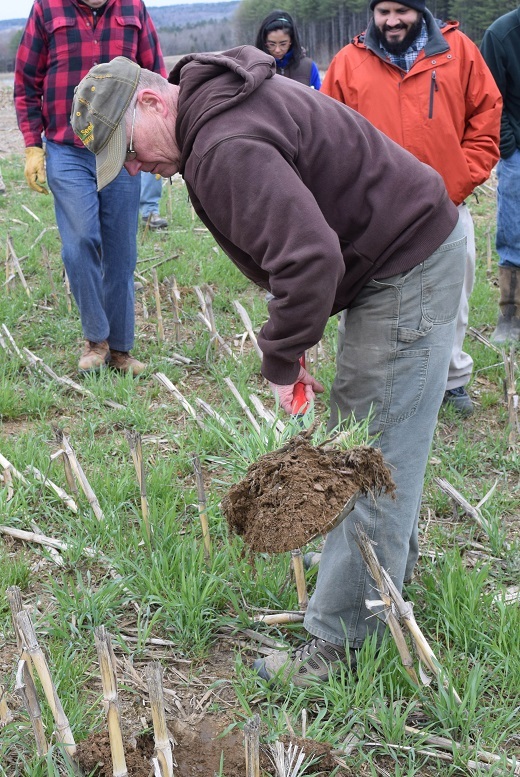 “The cover crop adds living matter (living roots) to the soil,” NRCS Resource Conservation Alice Begin said, pointing to deep alfalfa roots penetrating the fields on Fogler’s farm. “It gives a place for the microbes and worms to exist. When there aren’t living roots, the microbiology isn’t as active in the soil. In northern New England, establishing a cover crop late in the season after silage corn has been harvested can mean too short a growing window for certain species. While mixtures of multiple species are thought to be a positive thing, a producer needs to find the right one or ones that are compatible with their climate and the timing of their cropping system.